Custom Cheap Koozies Personalized with your logo Printed in Bulk. Inexpensive Patented Custom Coolie collapsible beverage insulator made of Open cell foam - durable polyester covered scuba foam. 1 side seam offers the largest advertising space available.personalized koozies -can coolers in a huge variety of colors. Our wholesale koozies are made of heat insulating foam of the best quality, with fabric exterior and no slip grip. They hold 12 oz. cans or bottles. Budget Prices for USA, Canada for custom personalized koozies. American clients pay no taxes.The promotional collapsible koozie provides a highly effective insulation: it will hold beverages cold or warm for a long time. Prices include your 1-color custom imprint. Very competitive prices and fast production time. The koozie folds flat and fits easily in your pocket. Unit prices below include your 1 color custom imprint on one sides. Absolute Minimum: 150. Please contact us for pricing above 2000. SUPERSPECIAL! FREE FREIGHT within continental USA when ordering 500 or more! 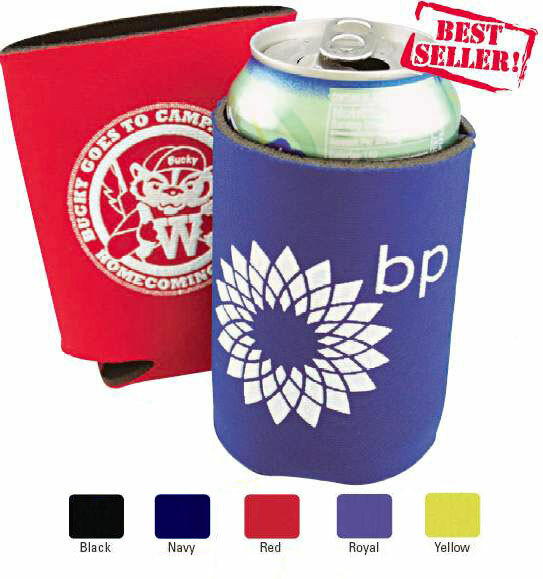 EXTRA IMPRINT COLOR: ADD $0.30 per koozie, per side. PRODUCTION TIME: 7-10 Days after artwork approval. Made with fabric covered open cell foam. Sewn on inside with 1 side seam. Collapsible for convenient storage and fits most beverage consoles. SIZE: ABOUT 3-7/8" W X 5-1/4" H when flattened. IMPRINT AREA: 3-1/2"x3" each side. COLORS: Black, Navy Blue,, Royal blue, Red, Yellow (see photo). PRODUCTION TIME: 5 Days after art approval, for 1 color imprint. Add 5 days if you require an additional imprint color. Rush production is available: contact us. Cheap Koozies Custom Promotional Personalized in Bulk.